Yarn wreaths. They all look so simple and cute. I thought to myself "what a quick and easy mothers day present". 1. Wrap styrofoam ring with yarn. 2. Make different shapes and sizes of fabric flowers. 3. 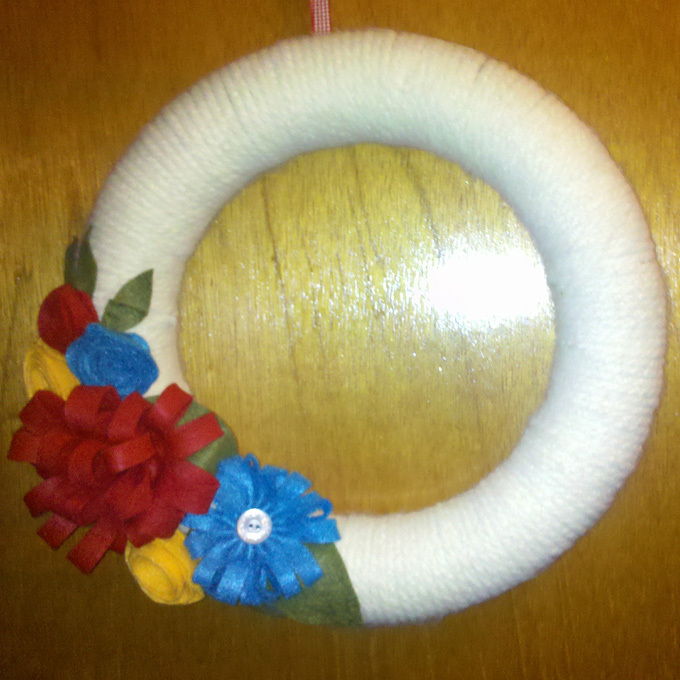 Glue, pin or sew flowers directly to wreath. 4. Add ribbon at top for hanging (optional). It was the actual wrapping of the yarn that got to me. Seemingly simple, yet I had the hardest time efficiently wrapping them. First, I kept dropping the wreath. Then, I kept getting the biggest tangled messes from my yarn. Then, as impatient as I am, I would cut it... and try again. I never understood why people unraveled all of their yarn just to re-wrap it into a ball. I'm not a knitter, nor do I dabble in any craft that requires yarn (until now). I understand the ball now. It makes so much sense. Yarn is a little bit evil. And who knew there were machines to "ball" it for you... check this out. Anyway, despite my aggravation, they came out great! Take a look. The thicker yarn worked out better for covering the ring. A yarn ball would have helped greatly. I did enjoy how these wreaths came out, and have so many ideas for flowers that would look adorable on wreaths, but I am not quite ready to jump back into wreath making quite yet. Anyone have any tips or tricks for easier yarn wrapping? 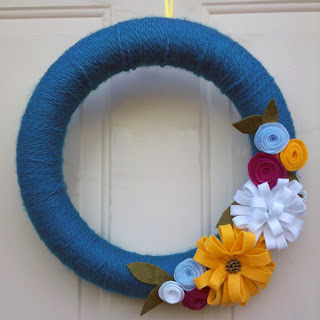 Or any other cute ideas for wreaths?